PVC Sheet & Rod is proudly supplied by Industrial Plastic Solutions which is located in Melbourne Victoria. The scientific name of Polyvinyl Chloride which is better known in the industry as PVC is used in a wide range of applications. An interesting fact is that PVC was accidentally discovered in 1872 by German Chemist Eugene Buamann. PVC is so popular in the Construction & Building Industry, that it is practically used everywhere such as waste water pipes, electrical conduits as well as window frames. excellent dimensional stability, and most importantly it is a self extinguishing Thermoplastic. This enables it to be used in instances where it is important that the plastic does not continue to burn. Another important property is that you can get PVC Sheet with UV protection. IPS provide all types of Plastic Fabrication using PVC Sheet. 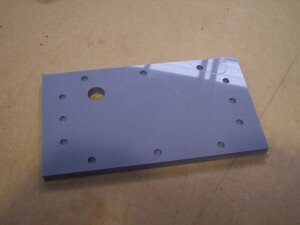 We can Cnc Route it for you to your drawings or send us through a DXF file or EPS and we will provide you with a free quote. We also perform PVC Plastic Welding services and can fabricate that custom chemical tank. • Water and wastewater treatment. • Corrosive fume handling (duct). • Corrosive resistant workstations and equipment. • Pump and valve components. Please feel free to drop in and show us your old broken PVC parts and we will take a look at them for free and let you know if they can be fixed.